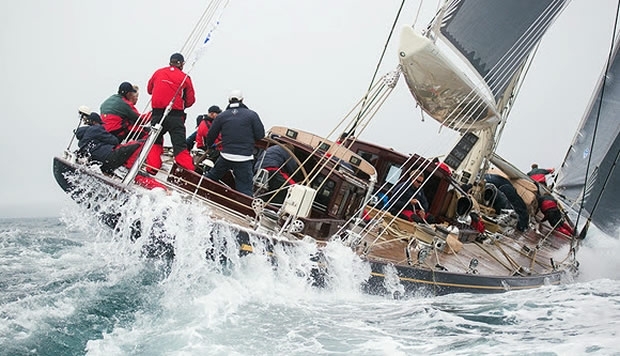 Velsheda won the fifth race of the J Class Falmouth Regatta in dull, damp conditions today to set up an exciting head-to-head tomorrow, Saturday; the oldest and most historic J set to take on the newest, most modern J which won more 2014 regattas than any other. Velsheda's race win, her third from five starts to Lionheart's two, ties the top two protagonists on six points apiece. Two short, sharp windward-leeward are planned for Saturday to decide the overall winner. Both opposing tacticians shrug off the very idea of a title match race, pledging to sail their own first race and then decide what happens, but the results table speaks volumes. On a murky day of 15-17 knots breeze marked by what locals call 'mizzle', drizzly mist, smart starting was the key to Velsheda's win. While Saturday is forecast to be a summer cracker - warm sunshine, moderate winds and a big spectator fleet forecast to reprise 2012's glorious finale - today was much more a 'Cornish pasty and soup' kind of day rather than cream teas and picnics on the headlands. Such conditions, visibility reduced in the mist to half a mile or less at times, may have thwarted shoreside spectators but it also placed a big premium on navigators 'computer games' calling accurate laylines from their data. Velsheda's time on distance to the committee boat end of the start line was to within two or three seconds, in anyone's book a perfect start, considering they had 180 tonnes of thundering J class yacht at max height and pace on the line at the gun. In fact the three boats raced bow to bow for a few minutes until Velsheda's windward position and starboard tack ownership finally became the telling factor while Ranger - starting towards the pin end of the line - found themselves pinned to the left, unable to cross and seemingly destined to chase Lionheart for the rest of the two lap windward-leeward. Indeed these two became sufficiently engaged that Velsheda - flying a conventional symmetrical kite downwind while the other two raced with asymmetrics - could step further ahead, finally winning by two minutes and one second. Strategist Hamish Pepper acknowledged their start on Velsheda was as good as it could be: "You really wouldn't want to be pushing it much harder. It was a pretty good one." Winning tactician Tom Dodson paid tribute again to his core of battle hardened Kiws which have been with the boat for many years, relishing the idea of a head to head with Lionheart. Dodson has no fewer than five America's Cup winners on board. "Our start worked pretty well. It was spot on. We have good comms with us all. There are such big consequences if you get it wrong. All three boats were going at about the same speed and so we were able to hold them all right to the layline. The scariest thing though is not seeing any of the marks and just trusting instruments all the time." Pepper commented: "We have such a good crew. The first crew boss was very structured in how we do each manoeuvre and so we got to the point where we could sub in people to the jobs, the job definition in there. But we are at another level now." says Dodson, "And today we had the symmetrical spinnaker up and so we were outgybing them with the same straight line speed." "Us and Lionheart are sharing the wins but I am sure Ranger will be putting in an appearance or two appearances tomorrow. I guess we won't be trying to play too much tomorrow." "We don't have the height Lionheart have upwind and so we have to start a bit differently. But if tomorrow we could have two starts like today's we'd be well set." "It will be pretty exciting and could end up all locked together on points with all three points. I am tired of match racing Ranger so it would be nice to get some good fleet racing." Lionheart's John Cutler says, "Starting is key and whoever gets a good start is in control and we have not been starting so well. All of them have been pretty ropey. Today we got an overriding turn as we tacked into leeward of Velsheda and could not get the job set. Our briefing has been about starting every day and it is getting a bit more under control each day. Tomorrow we will show we can get off the line. Today we all held each other out to the layline and whoever has got starboard tack gets it. We almost got them but Velsheda kept chipping away and did a nice job." For local Falmouth pro sailor Frano Tregaskis who is sailing on Ranger, racing in the J Class on his home waters is a bit of a childhood dream come true. He grew up racing at Restronguet in the wake of Ben Ainslie, before turning professional. He has raced on Lionheart and Shamrock before. "It is such good fun. There is so much interest in the town. I used to look at the history books when I was ten years old and see the stories of the J Class racing here off Falmouth, so to be back now doing it is a bit of a dream come true. To be one of the few people who has done that is great. And all my sailing mates are glued to the VHF in the rigging shops, the chandlers and so on, listening to the Irish Dentist, Donal, giving them the commentary," said Tregaskis with a smile.